Intervention of Professor Fr. Paolo Benanti, T.O.R. 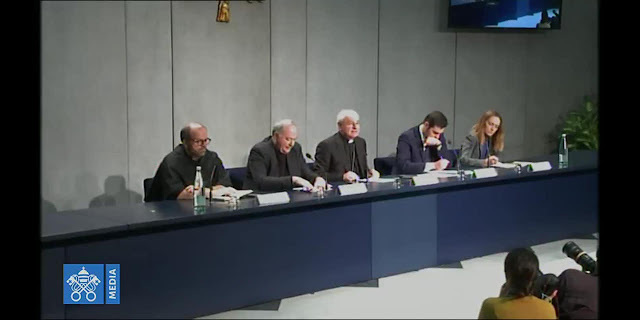 At 11.00 this morning, in the Holy See Press Office, a press conference was held to present the letter sent by the Holy Father Francis to the President of the Pontifical Academy for Life, H.E. Msgr. Vincenzo Paglia, on the occasion of the 25th anniversary of the institution of the Pontifical Academy on 11 February 1994, and of the upcoming General Assembly to take place from 25 to 27 February 2019 in the Vatican, on the theme: “Roboethics: Humans, machines and health”. The speakers at the conference were: H.E. Msgr. Vincenzo Paglia, president of the Pontifical Academy for Life; Msgr. Renzo Pegoraro, chancellor of the same Pontifical Academy; Professor Fr. Paolo Benanti, T.O.R., lecturer in moral theology and ethics of technology at the Pontifical Gregorian University and academician of the Pontifical Academy for Life; and Professor Laura Palazzani, lecturer in Biolaw and Philosophy of Law at Libera Università Maria Santissima Assunta (LUMSA), academician of the Pontifical Academy for Life. On 11 February 2019 we celebrate the 25th anniversary of the founding of the Pontifical Academy for Life. For this occasion, Pope Francis wished to send a letter, not merely celebratory, to thank all the members for the work they have carried out over the past years and to encourage the Academy to face with renewed commitment the task that guides its future. The title of the letter (Humana communitas) indicates precisely the focal point of this commitment. While we are in the midst of issues related to the care of creation, humanity is faced with a new and far more profound problem concerning the human family. In short, the focus on creation as a “common home” has entered within the boundaries that decide the future of the planet. Today, also for the extraordinary progress of technology, renewed attention to those who live in that house, that is, to the whole human family, is becoming increasingly urgent. And it is here that the Pope wants to draw the attention also of the Academy for Life, inviting semantic enlargement. “Life” is not an abstract universal concept: it is man in his history, it is the whole human family in the fabric of its bonds. The Pope notes the weakening of the bonds that constitute fraternity: “We should keep in mind that fraternity remains the unkept promise of modernity. The universal spirit of fraternity that grows by mutual trust – within modern civil society and between peoples and nations – appears much weakened. The strengthening of fraternity, generated in the human family by the worship of God in spirit and truth, is the new frontier of Christianity”. It is a challenge that affects the entire planet. The weakening of fraternity - whether we like it or not - contaminates all the sciences of humanity and of life. The Letter clearly shows the Pope’s attention to the cry that rises from the suffering of the peoples, so that we all notice it. However, the time of diagnosis is not delayed. He also wonders about the Church’s mission. And he asks whether as believers we have made an adequate contribution to the construction of a humanism that is not only confined to the ecclesial context, but capable of inspiring, motivating and implementing a more fraternal civil society in the world. What are we told by the paradox of a technoscience that with its tools could allow the whole of humanity to live in much better conditions, yet instead feeds inequality and, more profoundly, “the ennui of a life lacking in a purpose that can satisfy its spiritual yearning” (No. 3)? The Letter is not limited to reflections only on the general level. It also enters fully into specific topics. I will mention just a few. There is the theme of global bioethics. The processes of globalization increasingly link issues concerning life and health to social and environmental conditions. So, the practice of justice is brought into play. Given the plurality of cultures and scientific knowledge that interact ever more closely in our world, it is necessary to develop universally acceptable operational criteria that are incisive in the determination of national and international policies. Human rights are in many respects the terrain on which this confrontation takes place and it is therefore necessary to promote a correct interpretation of them, which, as Pope Benedict XVI said, must find the right balance with duties. Then there are the so-called emerging and convergent technologies, namely nanotechnologies, biotechnologies, information technologies and cognitive sciences. They expand our ability to intervene on living matter in an extraordinary way, opening up new spaces to our responsibility. This applies to therapies, but also to the hypothesis of strengthening living organisms. What is important to realize is that it is not just about making the individual functions of the organism more efficient or transferring them to artificial supports; at a deeper level, a new relationship with the world is at stake. New IT devices lurk with increasing pervasiveness in various areas of reality, including our body, which is increasingly exposed to the dynamics of administration according to criteria of technoscience (technocracy). It is one of the forms of what is usually called biopolitics. It is therefore necessary to participate in the discussion and encourage a broader participation of all the subjects involved, so that the development and use of these extraordinary resources is oriented towards the promotion of the dignity of the person and the most universal good. In short, we must be careful to avoid both the risk of reductionism of the human being and the other even more dangerous risk of the substitution of the human. The technocratic utopia, in this way, prepares the way for a functional enhancement of which we imagine ourselves masters, while we become slaves. The Pope therefore urges the Academy to enter into the territories of technology and to explore them with boldness, creativity, and careful discernment. Which means not having prefabricated answers derived from a pre-established abstract theory, but first of all attentively observing the phenomena in their complexity and engaging in a serious work of interpretation to understand how the new findings of science and technology affect our humanity. Then, elaborating criteria for evaluation that allow us to promote the dignity of every person and of all the populations that inhabit the planet. It is a task that brings into play the moral conscience, understood not as an applicative function of norms, but as the heart of the person understood holistically, in which the ethical dimension is not to be separated from the spiritual. Faith in resurrection encourages all, even non-believers, not to surrender to the depths of our affections and bonds, rejecting compromise solutions. Our common life - enchanted and vulnerable as it is - must be a theme of alliance for redemption for the human, not a commodity of exchange for the post-human. The date on which the Pope’s letter was signed is the feast of the Epiphany. It carries within it a symbol that can inspire us. The Gospel seeks the alliance of peoples, not the closure of the community. The Magi are the symbol of the sharing of the human and the convergence of his wisdom around the eternally begotten Son of God, Who becomes man and destined for man forever. They are in a sense academics and ambassadors of the human: they scrutinize the signs of heaven and life, they escape the complicity of Herod, and are happy to give their riches to the Child of Bethlehem, Lord of heaven and of life. The Pontifical Academy for Life was instituted by Saint John Paul II on 11 February 1994, with the Motu proprio “Vitae Mysterium”, following a suggestion by the great geneticist Jérôme Lejeune. Faced with the progress of science and technology in the biomedical sphere, with extraordinary possibilities for intervening in human life in every phase of its development, the need has emerged to study, inform and inform so as to explore further the ethical values and principles that ensure the integral good of the human person and the protection of life. In the light of the Christian Revelation and human experience, of reason and moral tradition, the Academy has studied and offered its reflections on themes such as. the new frontiers of genetics, the human embryo, and reproductive technologies, the quality of life, and ethics of health, aging and disability, the accompaniment of the dying and palliative care, and animal and vegetable biotechnologies. But new horizons continue to open and stimulate the research and the various activities of the Academy. This has also led to the updating of the Statute (18 October 2016), which have given further impetus to the Academy, with an increasingly interdisciplinary approach, and with dialogue and collaboration with various religious traditions, broadening the geographical and cultural horizons to face the ethical questions that challenge human life. Referring to the indications of Pope Francis, the current Statute (Article 1, § 3) recalls that: “The Academy has a task of a prevalently scientific nature, directed towards the promotion and defence of human life. In particular, it studies the various aspects that relate to the care of the dignity of the human person at the different ages of existence, mutual respect between genders and generations, the defence of the dignity of each single human being, the promotion of a quality of human life that integrates material and spiritual value, with a view to an authentic ‘human ecology’, which may help to recover the original balance of Creation between the human person and the entire universe”. And from this derive the recent studies: the role and impact of technology on human life and health, global bioethics, particularly in the areas of maternity and infancy; issues related to robotics and artificial intelligence; neurosciences; and genetic engineering. Working groups engaging with these issues are active and offer reports of scientific and ethical value, important for the Church and the whole of civil, legal and political society. Currently the Academy is made up of 151 members: 45 ordinary, 88 correspondents, 14 of the Young Academicians category and 4 honorary. They include doctors, scientists (a Nobel Laureate in medicine), theologians, teachers and researchers in the physical, biological, natural sciences and humanities. All five Continents are represented. Finally, the Pontifical Academy has a website (www.academyforlife.va), and is active on social networks with a Twitter profile, a YouTube channel, and Instagram. The advent of digital research, where everything is transformed into numerical data, leads to the ability to study the world according to new gnoseological paradigms. What appears to be the outcome of this new revolution is the domain of information, a conceptual labyrinth whose most widespread definition is based on the equally problematic category of data. The technological evolution of information and the world understood as a series of data is embodied in artificial intelligence (AI) and robots: we are able to construct machines that can make independent decisions and coexist with man. Think of the self-driving machines that Uber, the well-known private car transport service, already uses in some cities like Pittsburgh, or radio surgery systems like the Cyberknife, or robots for working alongside man in factory production processes. AI, these new technologies, are pervasive. They are insinuating themselves in every area of our existence. Both in production systems, incarnated in robots, and in management systems, replacing servers and analysts. But even in everyday life, AI systems are increasingly pervasive. In the development of artificial intelligences (AI) the presentation of the successes obtained by these machines has always been conducted according to a competitive model compared to man. These media appearances of AI could lead us to think that these are systems that compete with man, and that between Homo sapiens and this new machina sapiens/autonomous machine has established a rivalry of an evolutionary nature that will see only one winner, and will condemn the defeated to a inexorable extinction. In reality these machines have never been built to compete with man but to create a new symbiosis between man and his artifacts: (homo + machina) sapiens. There are extremely delicate challenges in contemporary society in which the most important variable is not intelligence, but the limited time available to decide, and cognitive machines are of great applicative interest here. At this level, a whole series of ethical problems open up in terms of how to validate the machine’s cognition in the light of the speed of the response that one seeks to implement and obtain. However, the greatest danger does not come from AI in itself, but from not knowing these technologies and leaving decisions on their use to a ruling class that is not fully prepared to manage the issue. If the prospect of the existence of people in the near future – in reality, already our present – is that of cooperation between human intelligence and artificial intelligence, and between human agents and autonomous robotic agents, it becomes urgent to try to understand how this mixed reality, composed of autonomous human agents and autonomous robotic agents, can coexist. The heart of the matter on the management and development of artificial intelligences is a broad space for ethical discernment that must take into account the potentially disruptive effect of these technologies linked to their potential for technological innovation. The field of robotics has made extraordinary progress: robots that were mechanical and static, passive, repetitive and executive objects, are now becoming “autonomous” entities, able to move and interact with the environment, with the capacity to learn and adapt to the environment, of perception, analysis, reasoning, decision, and expression. There are many areas of social application: civil (domestic, recreational, medical-health, educational, environmental) and military. The acceleration of recent developments in robotics and artificial intelligence, in the context of the so-called emerging and convergent technologies, raises complex ethical questions that require interdisciplinary reflection; hopefully, at least on some fundamental points, shared at international level in view of the regulation and “governance” of the new technologies. Many international bodies (generally consultative with a view to regulation) have approved opinions and documents on the subject. In particular, the World Commission on the Ethics of Scientific Knowledge and Technology (COMEST) of UNESCO issued an opinion on Robotics Ethics in 2017 (https://unesdoc.unesco.org/ark:/48223/pf0000253952); the European Group on Ethics in Science and New Technologies (EGE) of the European Commission published a Statement on Artificial intelligence, robotics and ‘autonomous’ systems (https://ec.europa.eu/research/ege/pdf/ege_ai_statement_2018 .pdf) and an opinion on the Future of Work, Future of Society in 2018; and the Italian National Committee for Bioethics, Biosafety, Biotechnology and Life Sciences, approved a document on Roboethics in 2017. The central themes under discussion in the international context, with reference to robotics and artificial intelligence, are: the protection of the physical integrity and the dignity of man with the application of principles of beneficence, not maleficence, proportionality (with risk/benefit balancing, minimization of damage to man in the planning, experimentation and use of robots); the limits of the so-called “autonomy” of robots and AI (robots as moral agents and the moral status of robots); the problem of the interaction between man and machine (to avoid substitution and to value irreplaceable human capacities; to avoid technological and psychological dependence on machines); the rethinking of responsibility (introduction of the notion of responsibility “shared” between builder, planner, designer, seller and user); justice (avoiding the “robotic divide”, guaranteeing equal access to the opportunities opened up by technology); information and formation of citizens, with the democratic promotion of a public debate; and the shared and transparent governance of the new technologies. The conference is intended, in the context of international discussion, to identify the specifics of Catholic thought on the topic, with particular attention to the concept of the “electronic” person and to value and limits of the autonomy and responsibility of man in the age of the artificialization of the body and of intelligence.